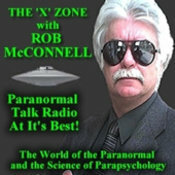 So in the early hours of this morning – 2-3 am to be precise – I was a guest on Rob McConnell’s X Zone radio program. The show will air tonight at 10pm EST and be repeated for 24 hours. It will also be available across a wide variety of media outlets worldwide. I gave to say, I really enjoyed it and Mr. McConnell turned out to be a great host and interviewer who has invited me back on the show already. Here is the interview and also the X Zone website.